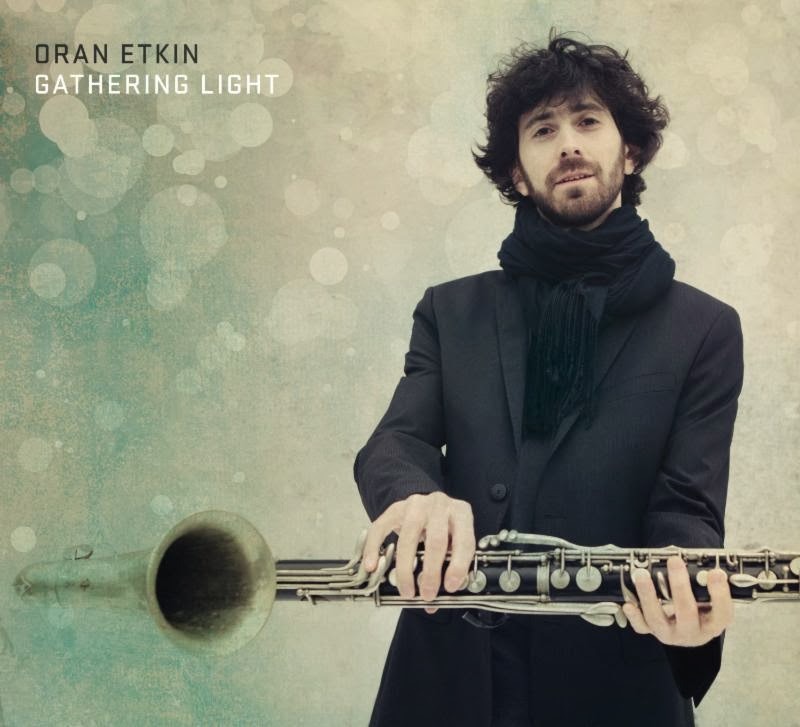 It's tough not to be seduced by the music on "Gathering Light" (Motema Music), the 3rd release from clarinetist/saxophonist Oran Etkin. Etkin, born in Israel and raised in Boston, Massachusetts, grew up listening to all kinds of music but it was Louis Armstrong that first really captured his imagination. Not only was he entranced by the sound of Armstrong's trumpet and voice but he also noticed the joy in the performances. Etkin studied various instruments before settling on clarinet and also fell head-long into an infatuation with West African music, a tradition not known for its use of reeds. Yet, as he has demonstrated on his previous Motema release, "Kelenia", Etkin's approach fuses different traditions without watering down the content. The new CD features the rhythm section of bassist Ben Allison (who shares Etkin's fascination with West African music) and drummer Nasheet Waits (who can and does play anything) plus, on 6 of the 12 tracks, Lionel Loueke (guitar, vocals) and Curtis Fowlkes (trombone). The music ranges from the playful "Gambang Suling" (that opens the program) to deep ballads (such as "Shirim Ad Kan" by Israeli composer Nachum Heiman) to the fiery ("Gratitude") to the sublime ("When It's Sleepy Time Down South", a tribute to Mr. Armstrong). The interplay of trombone, guitar and clarinet with Waits' New Orleans-flavored drumming on "Guangzhou Taxi" is just delightful, supported by the solid bass work of Allison. "All I Really Want To Do Is Dance" is a wonderful duet for bass and clarinet - they jockey for position, they chase each other around and finally join in the deep groove. The Trio moves slyly through a bluesy reading of the Klezmer classic "Der Gasn Nign (Street Song)", getting so quiet at times that it seems as they're floating. "Gathering Light" is contemporary music that celebrates the past, present and future, crossing barriers that divide governments but not people. Oran Etkin has travelled the world and understands the importance of musical dialogues - you can hear that understanding translated into sound on this most delightful release. For more information, go to www.oranetkin.com. Riverside is the name of the group created by trumpeter Dave Douglas and reed player Chet Doxas to celebrate their shared appreciation of the music of Jimmy Giuffre (1921-2008). They met at the Banff Centre several years ago where Doxas approached Douglas with the idea of combining their various approaches to Giuffre's music into a quartet setting. Adding the veteran bassist Steve Swallow (who worked with Giuffre in his "free jazz" trio with pianist Paul Bley in the early 1960's) and drummer Jim Doxas (the saxophonist's brother), the group pays tribute to the various small-group styles that Jimmy Giuffre investigated from the mid-1950s through the rest of his career. Only 2 of the 11 tracks come his songbook, the folkish "The Train and The River" (here given quite an uptempo ride) and the Jimmy Mundy/Johnny Mercer/Trummy Young tune "Travelin' Light" (a bluesy ballad recorded in 1957 by Giuffre with guitarist Jim Hall and bassist Jim Atlas and again in 1958 with Hall plus trombonist Bob Brookmeyer). 5 of the songs come from the prolific Douglas, including the hard-edged "Handwritten Letter" that features Jim Doxas and Swallow combining to truly light the fire under the front line plus the sweet ballad "Front Yard" that has a fine clarinet solo and creative work from the rhythm section. The latter track gives way to "Backyard", that has playful tempo changes and smart interactions of trumpet and tenor saxophone. Doxas' 4 pieces commence with the 2-part "Old Church, New Paint" - the "intro" section is really a lovely bass solo from Swallow. His muted electric tone has the feel of a blues guitar, its sweet gospel melody leading the way into the song. The tenor sax takes the melody line, delivering the soulful lines in a breathy tone. Douglas enters on the second verse, his counterpoint and harmony adding depth and spirit to the song. On the saxophonist's "Big Shorty", the quartet jumps right into the swing groove. Douglas rips into his solo, flying high atop the interactive drumming which continues right through the rambunctious tenor spot. All the while, Swallow is foundation as well as providing counterpoint. The program closes with the longest track, "Sing on the Mountain/Northern Miner", a nearly 12-minute opus that builds slowly from its hushed trumpet and tenor sax opening into a spotlight for Douglas - he takes his time, exploring the various angles of the melody, rising to his climax then slowly down into tenor solo. Doxas take a similar path but moves quickly into an intense interaction with the rhythm section. When Douglas re-enters, he plays quiet counterpoint then joins the tenor for the new melody that closes the track on the second melody, softly yet with an intensity to its lightness of being. If you have never explored the oeuvre of Chet Doxas, he has released 4 CDs as a leader plus has appeared on recordings with the Christine Jensen Orchestra, vocalist Karen Robinson, and the Sam Roberts Band. (To learn more about brother Jim's career, click here.) Anybody who follows modern music knows Dave Douglas and Steve Swallow. Riverside brings together 3 generations of musicians, all of whom love a challenge, who respect music and understand that we can appreciate the music of the past, learn from it and create new paths in the infinite universe. For more information, go to www.greenleafmusic.com and chetdoxas.com.